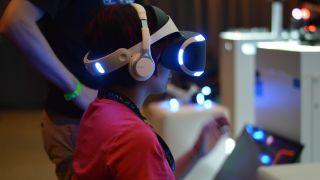 Sony has been unveiling more and more about its virtual reality device but so far it has been known by its pet name, Project Morpheus. Until now. At the Tokyo Games Show, Sony revealed that it is now called... PlayStation VR. So there you have it, Sony has decided not to go crazy with its nomenclature but stick to the basics - this is a VR headset for PlayStation after all. PlayStation VR still doesn't have an official release date but we are all hoping that we will see it some time in 2016. Project Morpheus was first announced at GDC 2014, but it wasn't until E3 this year when we started to see more of the games that would be available for the VR headset - including Battle Zone and London Heist. PlayStation VR will be launching into a rather crowded marketplace, with the likes of the HTC Vive in production and bigger and better versions of the the Oculus Rift arriving thick and fast. In our hands on PlayStation VR review, we said that: "There's still work to be done - edges were rough and objects seemed a little less than their HD display - but Sony is clearly determined to iron these out before it comes to market." Getting the name right is one big part of this. And if the newly renamed PlayStation VR headset is to be the first to really take the mainstream by storm then it's going to benefit more from having a simple, descriptive title than something funkier but far more vague. With a recent report estimating the VR industry is going to hit 30 million headset shipments by the year 202, there's an awful big slice of the pie that Sony could get hold of with PS VR. Who's closest to making VR a reality?